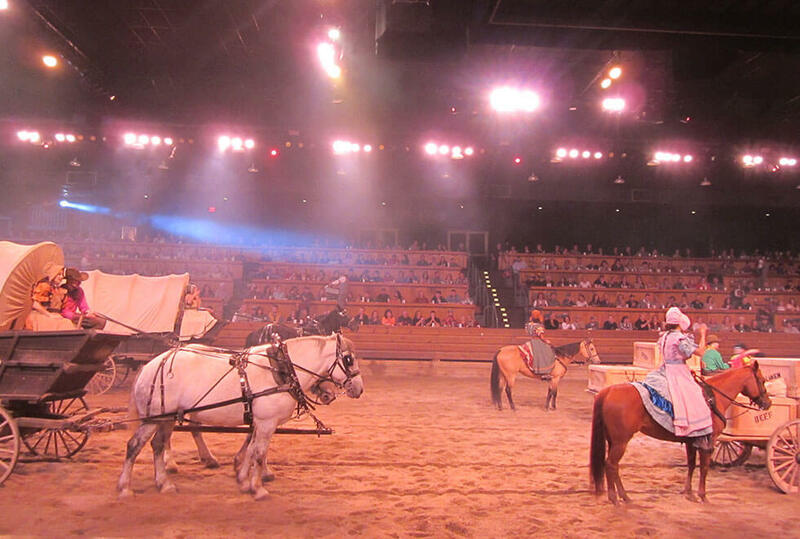 If you’re looking for things to do in Pigeon Forge, TN, during your stay, and a family-friendly experience is up your alley, Dolly Parton’s Stampede is an excellent choice! While they offer dinner and a show as the main attractions, you’ll find so much more to do while you’re there. You can pick out memorabilia at the gift shop, check out the stables, watch the pre-show, and grab a drink in a collectible boot mug before you’re invited into the arena for the main event. Arrive early for the pre-show and be entertained by Mountain Ruckus. They have a notable crew of their own including four-time banjo champion, Gary Davis. 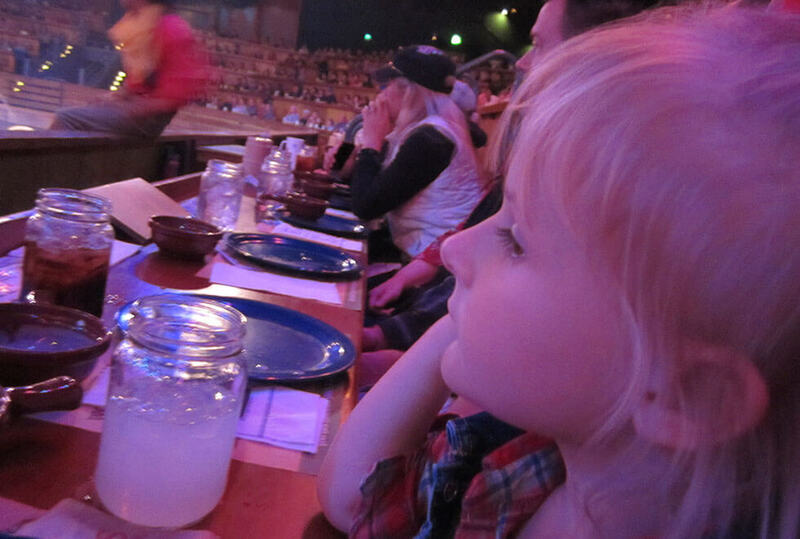 The Saloon show starts 50 minutes before the arena opens up for the stampede, and your little ones can get decked out (for a nominal fee) as a cowboy or belle while you wait. They sell snacks and drinks if you can’t wait for dinner. However, you should expect to have more than enough to eat with the feast you’ll get as part of the main show. Stampede flags are available for purchase in the saloon as well. After the Saloon experience, you’re invited into the 35,000 square-foot arena to be immersed in the sights and sounds that Stampede has to offer. 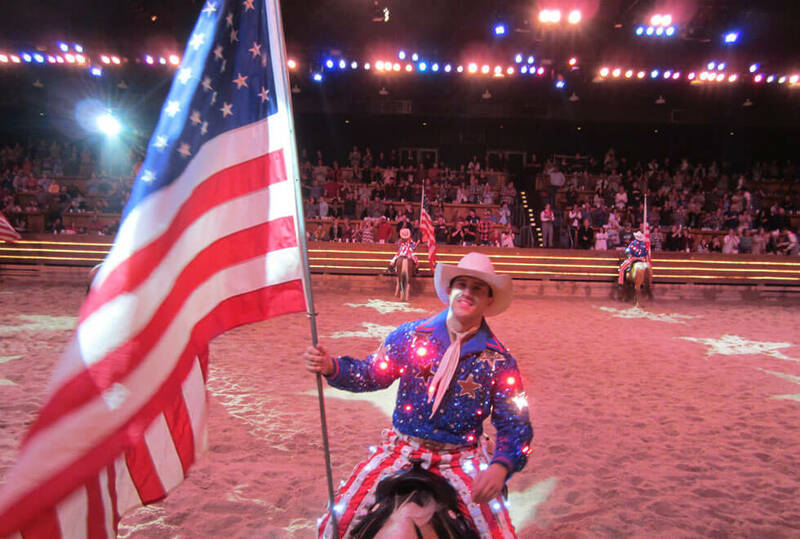 Your senses will be entertained by trick riders, animals like Texas longhorn and buffalo, dancing, music, magic tricks, comedy, and special effects. While you start watching, your servers will bring out your meal. It’s easy to get distracted by the delicious food, but make sure you stay focused on the show! If you can’t finish your plate of creamy vegetable soup, biscuit, whole rotisserie chicken, pork loin, corn on the cob, a potato, and turnover, you can always get a bag to take your food back with you. Don’t be afraid to ask for wet wipes (or take some with you) because you will get messy. There are no utensils (you may want to take your own, though the food is easy to eat without them)! 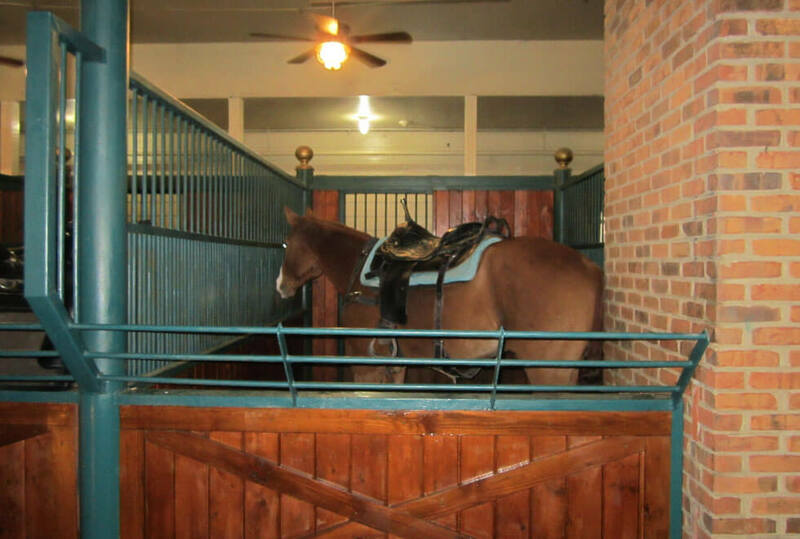 After the show, you can visit the stables and view the horses, or drop by the gift shop and pick up the mix for that delectable creamy soup and chicken rub. If you miss the shop, you can purchase online in the “Shop Stampede!” area of the Stampede website. Ready to check out Stampede? You can conveniently book your visit online (including souvenir boot mugs) and pick up your tickets at will-call.